CTI products are made in the USA of the finest materials available. The founders of CTI have many years of experience in the turf industry and have applied that knowledge to a new and improved line of aerification tines. All of the Quad, Talon, Vent and Deep tines are forged from a solid rod for greater strength and durability. 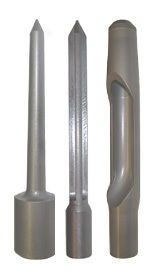 CTI is the only company in North America to make tines by this method. CTI has designed a state-of- the-art packaging which adds years to the shelf life of tines and metal products. Products arrive in a sealed, air tight flat-pack which contains a moisture inhibiting sheet that will significantly increase the shelf life. For more information, contact us or visit the CTI Ceres Turf web site.